Our Southern Playground Consultant, Donella Felton, worked with St Denys Primary School to install new and exciting playground equipment to develop the physical attributes of their youngest and oldest children. 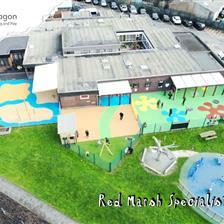 "We wanted to have a play area that would challenge the full age range of pupils here at St Denys Primary School. It was important that our youngest pupils had the opportunity to develop a full range of body awareness skills such as dexterity, agility and at the same time strength, balance and coordination but also, we needed to ensure that the equipment tested and challenged our year six pupils who wanted to have fun but at the same time keeping that physical challenge." 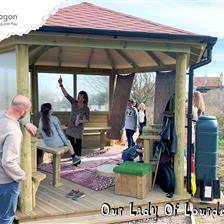 St Deny's Primary wanted a play area that would challenge the full age range of their pupils. It was important to them that their younger pupils at EYFS would have the opportunity to develop a full range of body awareness skills, such as dexterity and agility at the same time as strength, balance and coordination. However, they also needed to ensure that the equipment they chose would test and challenge their Year 6 pupils, who wanted to have fun but at the same time needed to experience greater physical challenge. It became clear that our Apollo Challenger was just the tool for the job! Once we had prepared the ground and cleared out the old bark pit from the site, the installation began. The combination of playground equipment really creates a group challenge, where children can play together, take turns, develop bonds and learn social interactions as they go. While exploring this huge structure, the children will be encouraged to support each other, cooperate and learn the values of teamwork. They can also challenge themselves as individuals, learn how to assess and take risks safely, and perhaps enjoy some healthy competition in a safe and supportive environment. This showcases why the Apollo Challenger is a fantastic resource for building self-confidence. With such a huge variety of playground equipment, all children across EYFS, Key Stage 1 and 2 will have opportunities to use a full range of body movements as they travel across the different physical challenges. This was a key requirement for St Deny's, and we are so pleased to hear from the school that they have “Absolutely achieved what we were trying to achieve. The children can’t wait to get on the equipment and we have a class using it every single day.” There is plenty of opportunity for climbing, hanging, swinging and balancing. Children are developing their balance, upper and lower body strength, core stability, and gross motor skills. Hands are strengthening too as they get better at gripping onto ropes and monkey bars, all good for developing their fine motor skills. Underneath the Apollo Challenger, we installed Playturf Artificial Grass to create an all-weather environment. It’s a beautifull safe surface which can be used year round without getting muddy, and reduces the risk of injury. 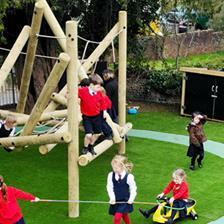 The staff and children at St Deny's are delighted with their new playground equipment. For us, it was a pleasure working with the school and seeing the area come to life. Our Apollo Challenger is already being well used and is popular with everyone. It is also being used for reward time for the children, and we think it’s a pretty good reward too!